Less than half a week left in my puns on the days of the week. Today, I bring you "ThornsDay." It is beautiful intense vibrant color and the great light accents it so well! An exceptional shot of a rather mundane subject and yet so perfect for your personal challenge! Your saturation made this really pop! great color and clarity .... 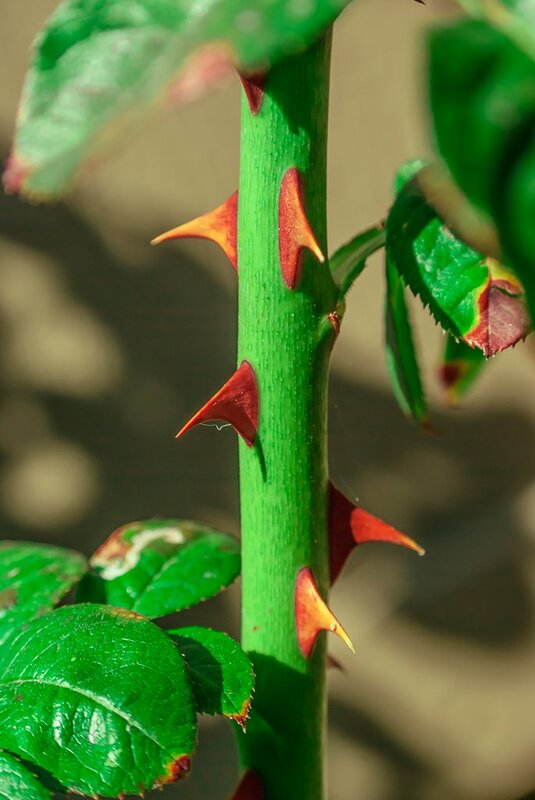 I like Amanda's comment "sharp"
those red thorns really stand out, nice shot! What a beautiful shot to make it all the way to the PP Chris! Congratulations! Haha, "Sharp!" I'm thinking about the image quality. I didn't catch what Amanda meant until Lynn mentioned it! Thanks! Thanks everybody for all the nice comments and for helping this simple image to make the PP! Glad you liked the color pop of the thorns! I agree- the color is very appealing because it's so rich. Good shot- such a fun idea with these pun-days!